Led by Henrik Lundqvist's 35 saves in a second consecutive shutout, and goals from some unlikely sources, the New York Rangers beat the Washington Capitals 5-0 in Game 7 Monday night to reach the Eastern Conference semifinals. New York contained Alex Ovechkin again and completed its comeback after trailing in the series 2-0 and 3-2 -- the latest in Washington's long history of playoff collapses. Ryan Callahan added a goal 13 seconds into the third period, and when Mats Zuccarello scored with about 13 minutes remaining, thousands of red-clad fans streamed to the exits. Soon after, when Lundqvist fell forward to smother a puck, chants of “Hen-reeek! Hen-reeek!” from the no-longer-outnumbered Rangers supporters rose in the arena. From the moment Mike Ribeiro's overtime goal gave Washington a Game 5 victory, Lundqvist was simply superb. The Swede stopped all 62 shots he faced in Games 6 and 7, showing exactly why he won the Vezina Trophy as the league's top goalie last season and is a finalist this season. A Capitals offense led by two-time MVP Ovechkin managed to score 12 goals the entire series -- and zero over the final 120 minutes. 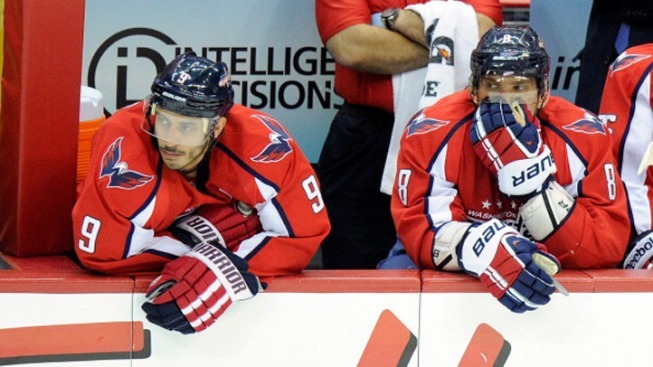 Indeed, Ovechkin was held without a point in Games 3-7. The Russian wing led the NHL with 32 goals but he heads into the offseason after the longest playoff point drought of his career. He had a goal in Game 1, an assist in Game 2, and that was it. Ovechkin delivered some big hits early in Game 7, but he was credited with only one shot by the end of the second period, which closed with some boos from the red-clad spectators in the stands. New York's top scorer in the regular season, Rick Nash, didn't have a goal against Washington, but the Rangers found other players to pick up the slack. While Callahan did have 16 goals this season, the other four Rangers who put pucks past Braden Holtby combined for a total of only 14. The Rangers-Capitals finale began only a little more than 24 hours after the shoving- and wrestling-filled end of Game 6, which New York won 1-0 on Derick Brassard's second-period goal and Lundqvist's seventh career postseason shutout. That, of course, was played at Madison Square Garden, continuing the pattern of the home team winning each of the first six games of the series. That ended emphatically Monday, in a Game 7 similarly anticlimactic to Washington's 6-2 loss to Pittsburgh in 2009. Since the start of the 2008 playoffs -- when Washington's core of Ovechkin, Nicklas Backstrom and Mike Green made their postseason debuts -- the Capitals have appeared in nine series, and this was the seventh to last the full seven games. They're now 2-5 in those, and Ovechkin and Co. have never been beyond the second round. Going further back, to 1985, the Capitals have lost nine series in which the club led either 2-0 or 3-1. Not much they could do with the way Lundqvist performed, helping New York reverse a little bit of playoff misery of its own: Until Monday, the Rangers were 0-5 in Game 7s on the road. Moments later, 19-year-old Tom Wilson had a close, open look thanks to a steal behind the net by Matt Hendricks, but Lundqvist made the reflex save. The Capitals had more and better early chances, generally keeping the puck at their offensive end, but it was the Rangers who went ahead 1-0 at the 13:19 mark of the first period -- thanks to a quick rush when Washington didn't get back on defense fast enough. Green, who led NHL defensemen with 12 goals this season and scored the OT winner in Game 2, skated in for a 1-on-1 chance that Lundqvist kicked away. Tumbling to the ice, Green managed to swat the puck back toward the crease. Again, Wilson was in the right spot. This time, though, the puck bounced over his stick, and the Rangers raced the other way for a 4-on-2. Chris Kreider, scratched for Games 2-5, sent the puck to Asham, whose shot from the top of the right circle zipped into a tough-to-find spot above Holtby's shoulder and the crossbar. It was fourth-line winger Asham's second goal of the series, matching his output for the entire regular season -- and doubling Ovechkin's postseason total against New York. Soon after, Ovechkin's nice pass along the boards freed Jay Beagle for an attempt that Lundqvist batted away. Marcus Johansson was in position for a rebound but couldn't get it in the net, either. The Rangers doubled their lead 3:24 into the second period. Eminger took a shot from the right side that was redirected by teammate Derek Dorsett straight to the stick of Pyatt, who flipped it past Holtby. And soon it was 3-0, when Del Zotto's wrister from the top of the left circle appeared to glance off Capitals forward Troy Brouwer's skate before sliding through Holtby's legs. There were still nearly 35 minutes of regulation left, and yet the game felt finished. The crowd, so boisterous earlier, went silent for stretches as Washington's fans contemplated another early playoff exit. NOTES: The Rangers will open on the road against the Bruins, who beat the Toronto Maple Leafs 5-4 in overtime in Game 7 Monday. ... Asham also scored in New York's Game 3 victory. ... Ovechkin's longest span without a point this regular season was three games, something he went through twice: Feb. 14-21 and March 9-12. The Rangers were the opponent in the middle game of both of those droughts. ... The Capitals owned the most effective power-play unit in the NHL this season. But they didn't get any opportunities in Game 6 on Sunday, and their first of Game 7 came with 78 seconds left in the first period. Asham was whistled for a hit on Hendricks, ending a gap of nearly five full periods between power plays for Washington; their prior one came 1:52 into the third period of Game 5.